Easy to hold scissors for small hands. Handles have one oblong side to allow better control. Universal design is ideal for both right and left handed use. Stainless steel blades with molded plastic handles. Assorted colors. 5". Blunt Tip. 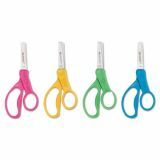 Easy to hold scissors for small hands. Handles have one oblong side to allow better control. Universal design is ideal for both right and left handed use. Stainless steel blades with molded plastic handles. Assorted colors. 5". Pointed Tip. Safety Scissors not cutting it? The dilemma of how to encourage the learning process while maintaining safety is sometimes difficult to solve. 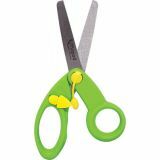 "Safe" scissors tend to sacrifice effective cutting, which can lead to frustration and misuse, or disinterest. 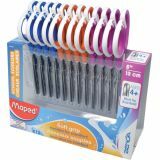 The Pencil Grip had developed a new product seeking to strike that balance between safety and effectiveness, with the Ultra-Safe Scissors. The design is simple, but functional, involving a shield that prevents accidental mis-cuts, along with a blunted tip to prevent injury from poking. 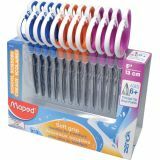 This allows the blades to be sharp and useful. ...and, perhaps best of all, no more surprise haircuts! 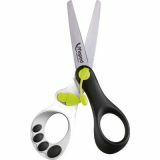 5" scissors feature asymmetrical handles with soft-touch ergonomic grip for maximum comfort. Stainless steel blades. Assorted colors. Classpack of 12. Blunt Tip. 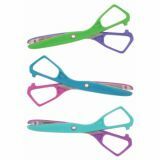 5" scissors feature asymmetrical handles with soft-touch ergonomic grip for maximum comfort. Stainless steel blades. Assorted colors. Classpack of 12. Pointed Tip. 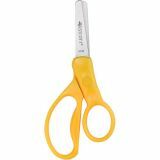 5" scissors feature asymmetrical handles with soft-touch ergonomic grip for maximum comfort. Stainless steel blades. Assorted colors. Single. Blunt Tip. 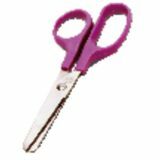 5" scissors feature asymmetrical handles with soft-touch ergonomic grip for maximum comfort. Stainless steel blades. Assorted colors. Single. Pointed Tip. For the early learner or special needs student. 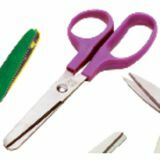 Scissors open automatically with spring action for assisted cutting. 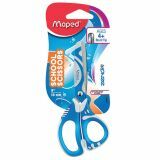 Ideal for learning how to cut out effortlessly thanks to their automatic opening. 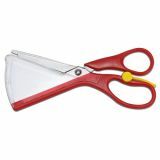 In addition, their rounded ends mean they're safe for small hands and their look will appeal to all small schoolchildren! Assorted colors. 5"L.